Fitted skirt fits up to a 19" mattress. Full One Year Warranty with service available after one year. - Exclusive Technology. - Machine wash and dry. Machine washable. Fits mattresses up to 19", ensures a snug fit. NEW CANNON QUEEN SIZE HEATED ELECTRIC MATTRESS PAD. FITS UP TO A 20" THICK MATTRESS. machine wash/dry. 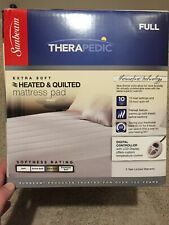 Therapedic Sunbeam Quilted Mattress Pad Extra Soft Heated Digital Auto Off Full. Condition is New with tags. Shipped with USPS Priority Mail. NEW CANNON FULL SIZE HEATED ELECTRIC MATTRESS PAD. FITS UP TO A 20" THICK MATTRESS. machine wash/dry. color ~ White. Machine wash and dry. - Full One Year Warranty with service available after one year. Machine wash and dry. - Exclusive Technology. Biddeford Heated QUILTED FULL Mattress Pad with Controller Auto Shutoff - NEW. Condition is New with tags. Shipped with USPS Priority Mail. 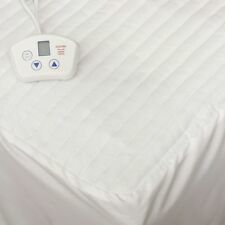 Quilted Heated Mattress Pad. Heated mattress pad. Cozy way to relax while staying warm. Automatic safety shut off after 10 hours Comfortable construction. Turn down your thermostat to save energy overnight while remaining comfortably warm Adjustable to your liking. Biddeford Blankets Electric Heated Mattress Pad, Queen brand new DIRECT FACTORY! Each blanket is designed with an ultra-thin wire and graduated warmth zones that provide you with more heat at your feet. The blanket is made from 100% polyester and is machine washable and dry-able. Biddeford Heated Quilted Full Mattress Pad w/ Controller Auto Shutoff New 54x75"
No more getting into a cold bed! It also features a 10-hour automatic shut off for added safety. Made from 50% cotton and 50% polyester, the quilted construction top allows for a super comfortable cushion of warmth to lie on. Heated Mattress Pad, Home Bedwarmer Queen 60" x 80"
Heated Mattress Pad, Home Bedwarmer 38" x 74"
Full One Year Warranty with service available after one year. - 10 warming settings provide personalized comfort. - Exclusive Technology. - Machine wash and dry. 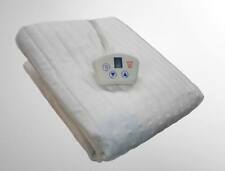 Twin size Heated Mattress Pad 39" x 75". Machine Wash & Dry. Fits Mattresses up to 22" Deep. 10 Hour Shut Off. Don't just warm up your bed; rejuvenate yourself as you improve your sleep. You already know that you can save money by turning down the thermostat at night, but did you know that you also sleep better in a cooler room?. This is a brand new still in the box and I have two available. All proceeds go to the Home Stretch Dog Haven! Stop by and "like" us on facebook! Ultra thin wires. Model No:16211. Low running costs - from as little as 1p per night. Model No: 36960. 6 Temperature settings. Fully fitted with generously deep elasticated skirt. Hello... This listing is for a Sunbeam Queen Size electric heated mattress pad. Brand New Never used.Feel free to contact with questions. Thanks! 6 temperature settings including a pre-heat facility. HealthProtection finish reduces and provides protection from dust mites, bacteria and mould. Power light indicator shows when the blanket is on/off. GENUINE DREAMLAND STARLIGHT COSY TOES EXTRA LARGE SINGLE ELECTRIC HEATED UNDERBLANKET. Extra foot warmth technology for extra cosy toes. Machine washable and tumble dryer safe. BEAB Approved. PART NUMBER - 16212. Machine Washable: 40°C. Low running costs - from as little as 1p per night. Brand new in the package Biddeford delightful nights automatic heated mattress pad twin (39” x 75”) 100% polyester, five year warranty, safety automatic shut off, convenient machine washable, comfort ultra thin wire, analog solid state controller, safety control feature : analog controller automatically shuts down after 10 Hours assuring safe operation, save Entergy reduce home heating bills,Fitted skirt ensures a snug fit and fits up to a 19 inch mattress. 10 heat settings--easy and convenient--just plug in and select your desired warming preference from 10 custom heat settings. Machine washable delicate. Fits mattresses up to 20". Warm up your bed in just 15 minutes with this small double Snug Heated Underblanket. Overheat protection. Size W107, L122cm - suitable for small double bed. Safety features Machine washable. Low energy consumption. NEW CANNON QUEEN SIZE HEATED ELECTRIC MATTRESS PAD. FITS UP TO A 19" THICK MATTRESS. machine wash. 5 year limited manufacturer warranty.